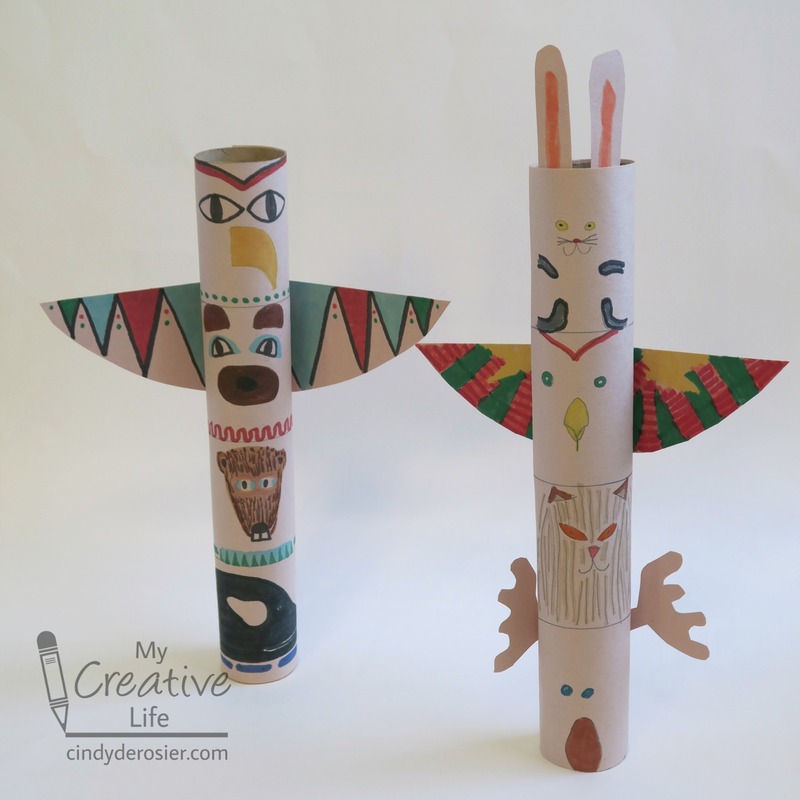 Check out the totem poles that Trevor and I made! 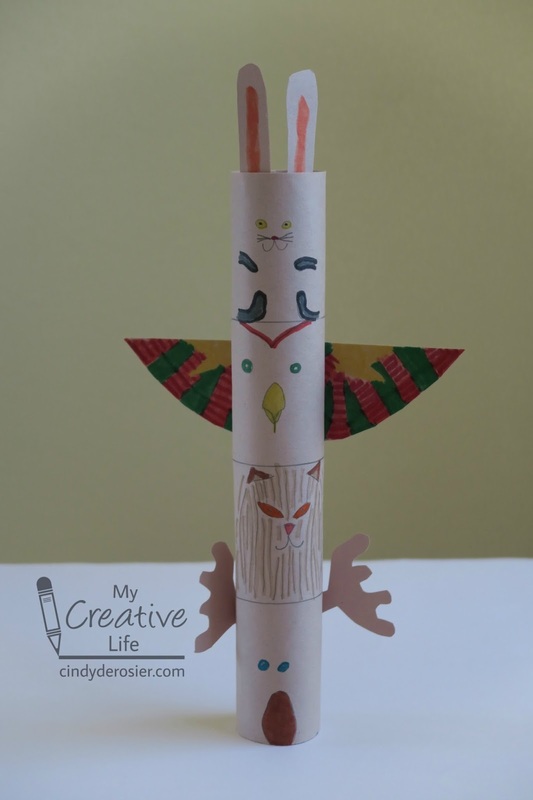 We discovered this fun craft in the Little Passports Alaska Journal (affiliate link). 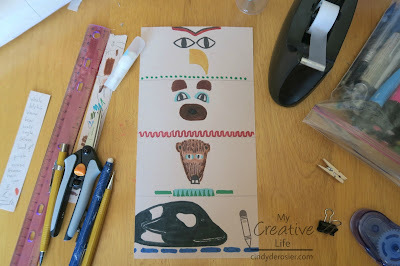 It was a fantastic way to remember the beautiful totem poles and majestic animals we saw during our trip to Alaska last month. To make your own totem pole, you need one sheet of construction paper, one paper towel tube, a ruler, a pencil, scissors, markers, tape and/or glue and binder clips. Start by wrapping the construction paper around the cardboard tube. Cut the paper so that it is the same height as the tube and has only a slight overlap in the back. Lay the paper flat on the table. Use the ruler and pencil to draw horizontal lines that divide it into four equal parts. Draw the face of one Alaskan animal in each of the four parts. This is mine, with an eagle, bear, beaver and orca. Attach the paper to the tube. We put glue along the edges and the back seam, then taped over the back seam and secured the whole thing with binder clips. 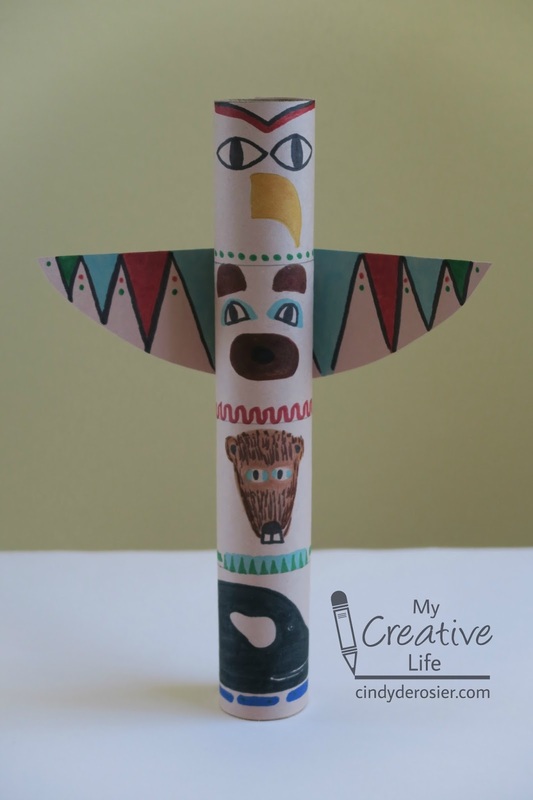 While the glue is drying, create wings for any birds on your totem pole. Glue them to the back. The Alaska Journal tells what an eagle, bear, wolf and whale symbolize; Trevor and I did some research to learn what the Alaskan animals we'd chosen represent. You might choose to learn about the symbolism first and then select the animals, but we really enjoyed seeing what our selections said about each of us! This is mine. The eagle stands for power, wisdom and leadership. The bear stands for strength, motherhood and protection. The beaver symbolizes vision, planning and hard work. The orca stands for strength, power and grace. This is Trevor's. The rabbit symbolizes good luck, beginnings, and abundance. The eagle symbolizes power, wisdom and leadership. The lynx represents silence, balance and perception. The moose stands for protection, adaptation and discernment. Thanks to Little Passports for another fun and educational activity for Trevor and me to do together! Funny thing: if you bring up the big view of Trevor working on his totem pole, you can see Trouble (Trevor's rabbit) pulling on the gate trying to get into the room. Which is very appropriate as he's got a rabbit on his totem pole.